Rainforests and wetlands are the fastest disappearing habitats on earth. They are also the areas of the globe that contain the most biological diversity. Costa Rica has earned a global reputation for environmental protection, yet rapid tourism growth, unregulated development, and global demand for natural resources are altering the marine and terrestrial landscapes of the country. Areas as biologically rich as the Osa Peninsula are often the first places to be exploited and as a result, face significant conservation challenges. Luckily, remoteness and an important network of protected areas have allowed much of Osa’s landscape to remain intact or recuperate from prior degradation. Public protected areas in the Osa region. Much of the peninsula is protected by Corcovado National Park, yet it remains under threat. While parks are vital to biodiversity conservation, they are often not sufficient to sustain viable wildlife populations and ecosystems. It is critical that private lands connecting national parks and protected areas are properly managed and restored to provide habitat continuity for keystone species like jaguar and peccary. 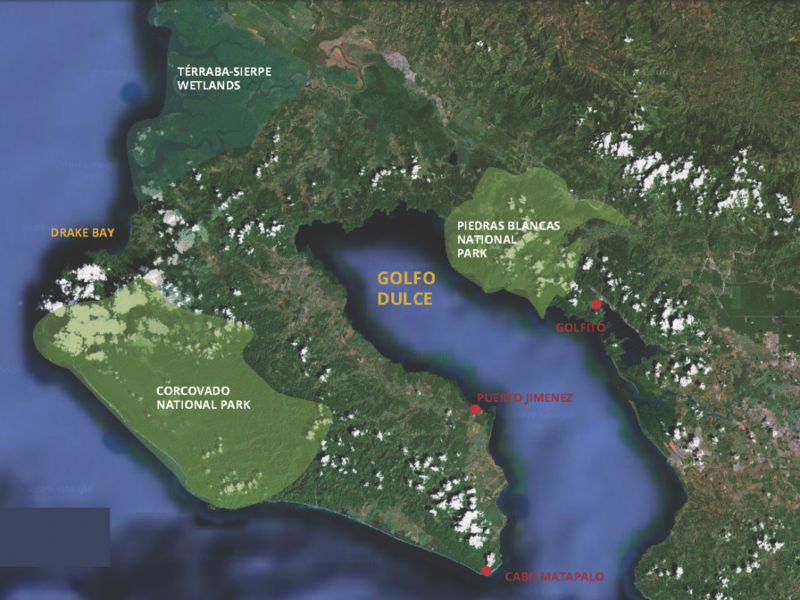 In addition to magnificent rainforests and invaluable wetlands, the watersheds and coastal-marine habitats around Osa’s Golfo Dulce support abundant wildlife and provide economic opportunities for local communities whose livelihoods depend upon the health of these ecosystems. Protecting the Osa’s natural treasures is a necessary first step in sustaining both people and nature in this important region.